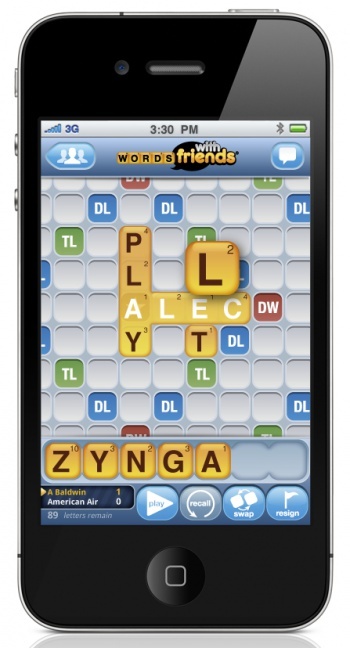 Zynga : "Let Alec Play"
Zynga shows their support for veteran actor Alec Baldwin, after an angry strop over a game of Words With Friends got him kicked off an American Airlines flight. The story thus far: Alec Baldwin was quite happily sitting on a plane enjoying a game of Words With Friends when an air stewardess asked him to switch his phone off for takeoff. Baldwin, incensed at having his game interrupted, expressed his displeasure by shouting and slamming doors until the airline staff decided enough was enough and kicked him off the plane. "Flight attendant on American reamed me out 4 playing WORDS W FRIENDS while we sat at the gate, not moving," he tweeted. Later, he added "Last flight w American. Where retired Catholic school gym teachers from the 1950's find jobs as flight attendants." Shortly thereafter his Twitter account was deactivated. Baldwin has since apologised for the outburst, but did add that other passengers were using their phones during takeoff. "He loves 'Words with Friends' so much that he was willing to leave a plane for it," joked his spokesman. When quieried, Zynga, the developers responsible Words With Friends, responded with image to the right. While the idea that using your phone, laptop or DS during take off will cause the plane to come hurtling back to earth in a terrifying fireball has been dismissed as an urban myth, the Federal Aviation Administration still it takes it very seriously. Airlines caught ignoring the policy - and yes, the FAA does check - can be given massive fines. That's why airlines insist you turn your phone off, it's not because they hate fun. Well, okay, maybe some of them do.